The work will restore the sculpture after years of wear from students and tourists. 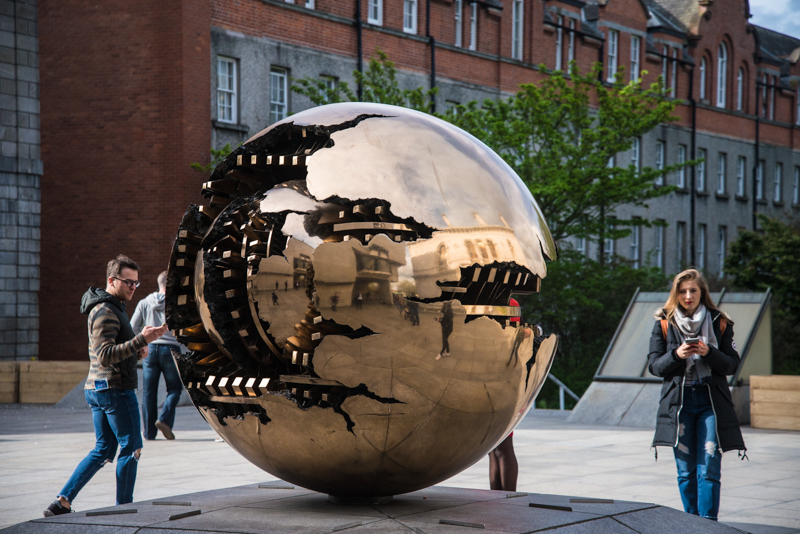 The famous campus sculpture Sphere Within Sphere, located in front of the Berkeley Library, is undergoing conservation assessments this October, closing off one of Trinity’s most memorable monuments from tourists. Maintenance of the monument is the focus of the works, which are part of routine conservative efforts carried out every several years. The “Pomodoro Sphere”, named after its designer and creator Arnaldo Pomodoro, will be protected by surrounding fencing throughout the restoration process. It is the first such conservation assessment since a major project was carried out on the monument in 2008, during which both external and internal parts of the sculpture were repaired. The statue, which pivots when pushed, is popular among tourists and visitors to the College. The restoration in 2008 saw the surface of the sculpture returned to its original state after weather and use had dulled the surface. The sculpture, two metres in diameter, depicts a fractured sphere. The size of the sculpture varies in each location as does its pattern of fractures, and is intended to create a sense of confusion as to what the sculpture actually depicts. Some experts believe Pomodoro is making reference to how fragile and complex the world is. Inside, the sculpture is made of an intricate system of cogs and gears. The internal aspect of the sculpture is rarely in view but during the restoration process those who walked by were given a glimpse of it as work was carried out. Pomodoro refers to the internal workings of his spheres as “sign systems”, referring to the systems of language or complex organic bodies. The bronze statue is one of a number of versions of the piece by Pomodoro, the first of which was produced in 1963 with other iterations to be seen in places such as the United Nations Headquarters, the University of California and the Vatican Museums, with the version to be seen in Trinity being presented to the College in the 1980s by Pomodoro himself. The spheres are cast from plasters of clay originals before the bronze is added. The conservation works will be conducted by Hall Conservation of England, the same team that carried out the 2008 repairs under the supervision of Agostino Ragusa – who was specifically recommended to the College by Pomodoro. These routine conservation works come after a busy tourist season for Trinity. With the campus community celebrating 425 years since the foundation of the College and the Berkeley library celebrating its 50th anniversary, there have been thousands of people passing through Trinity’s gates.